Cognac Brandy by Hine of Cognac, Brandy. Velvet smooth on the palate, a complexity of dried pectin characters, marmalades and cocoa, vanilla toasty oak and sweet, scorched fruit flavours. 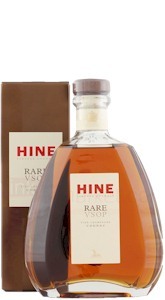 Thomas Hine left his home in Doreset at the age of sixteen. . H by HINE VSOP is superb on its own and the perfect base for many cocktails both long or short.